This cute, cheerful woodland scene is perfect for newborn babies. Great on onesies, bibs, and blankets. 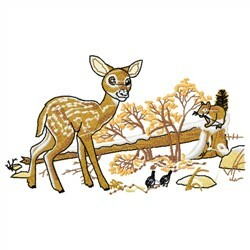 Embroidery Stitches is happy to present Fawn & Squirrel machine embroidery design which has 25908 stitches and is [149.86 mm x 86.61 mm] large. If you would like to view more embroidery patterns please search on our embroidery designs page.